I’ve been a bit blog-awol of recent. Many reasons including continuous holiday prep (see previous blog!) and a teething 7 month old. But the majority of my time, energy, wine and will to live lately has been used up on my eldest monkey AND I’M BLOODY EXHAUSTED!!! Many of you reading this will know me, and maybe have the pleasure of knowing him too, so I hope you’re not going to roll your eyes reading this when I say he is A LOT of hard work – actually I’d bet more work than a lot of lovely toddlers we know! I’d never heard this phrase before so I smiled and of course then whipped out my phone to google the meaning, quietly hoping…nah turns out it’s just another way of saying he thinks he’s a little sh*t.
He’s often called a Terrible Two, Twoligan, Threenager (well, he will be in 2 months), A Handful, or my personal favourite ‘Spirited’. And sometimes people will remark ‘Oh he’s such a BOY’ and I sigh. I guess if you MUST call him something, call him WILD. He’s a wild child. It totally suits him. He’s loud, he’s boisterous, he’s always laughing, shouting and screaming. He’s always running, climbing and jumping. If ever we are out everyone around us will know his name because I have to yell it so loudly to get him to listen to me. His tantrums are fierce. He kicks, he stamps, he moans for what seems like hours. He’s always the kid who finds a way to get inside somewhere he’s really not allowed. He’s always the kid who won’t sit still in the restaurant and crawls about the floor under all the tables. He’s always the kid being taken screaming to the corner of the room for a ‘little chat’ with his daddy. There isn’t a ‘reason’ why he’s like this. We have rules, we have boundaries, we are strict about a lot of things. We are teaching him about right and wrong, good behavior and times he makes us sad. We discipline him and we praise him. I honestly don’t think it’s anything to do with his age, and I am confident that we are doing everything ‘right’. He is just the way he is. Hes totally switched on – he was potty trained a month after he was two which astonished me! His imagination is astounding. He makes up stories and songs. He narrates as he’s playing by himself. He’s a brilliant problem solver. He wears his heart and his emotions on his sleeve. He’s ridiculously loving and kind. He’s crazy about and super protective of his baby brother and his friends. He’s extremely passionate and enthusiastic. Everything is amazing to him and needs investigating. Everything is fun just waiting to happen. He loves life and lives it at full speed. He amazes me every single day with how bloody brilliant he is. So whatever you think about nature vs nurture, I’m pretty sure we haven’t ‘made’ him wild. He is just the way he is and I wouldn’t have him any other way at all. 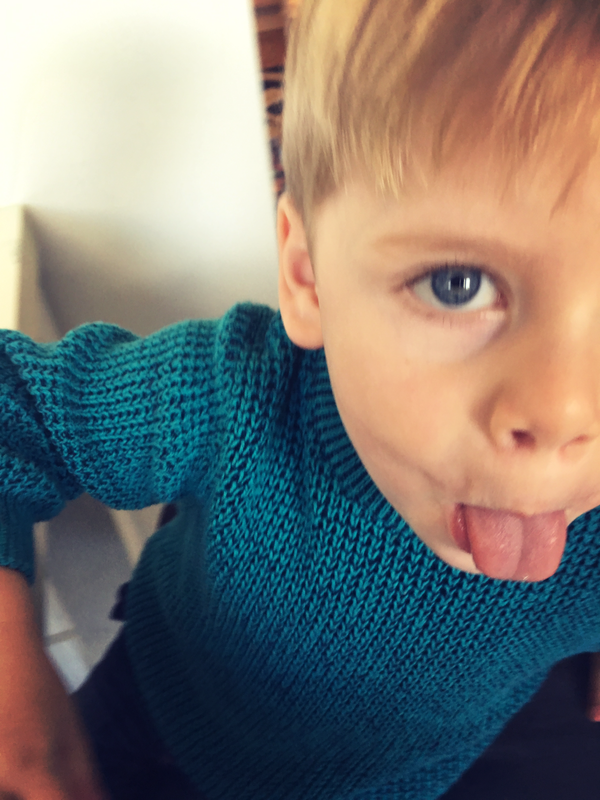 It’s too early to say what littlest is going to be like, but he’s already showing plenty of the same cheeky personality – he probably can’t help it being around his big brother 24 / 7. Life in our house is loud, and I’m sure in a couple months it’s going to get a WHOLE lot louder! I am secretly stashing bottles of wine in the cupboard under the stairs in preparation.